Jun - 10 | By: zikri | No comments. Mentawai selected and included in the agenda of the International Surfing Championship (ISC) ​​2011 “Mentawai Surfing Championship” which was held June 22 through June 26, 2011. Previously, the International Surfing Championship was held in West Java Cimaja “West Java Cimaja Open Championship” at 13 to 18 June 2011. A most prestigious event for surfers national level. As an international tourist destination, surfing the Mentawai Islands has brought the name into the international arena. The beauty of the surf Mentawai, among surfers world has equated the archipelago located in the administration of West Sumatra Province with Hawaii. Mentawai only one area in West Sumatra that became world surfing destination. National Surfing Competition that was held for 4 days from 22 June to 26 June it will be covered by several television stations, both national and international. International Surfing Championship after supporting a number of activities surfing world, present in the Mentawai collaboration with the Department of Tourism Culture Youth and Sports. In addition to bring into the open class surfing competitions and master classes are also incite women. For Mentawai Islands District event can be used as a promotional event, to introduce the uniqueness of Earth Sikerei from both cultural and natural. Surfing competition also witnessed an event that could draw for tourists. Besides enjoying the match, the tourists also can make the stretch of white sandy beach with clear sea water as a playground for families. Tourists can obtain the Mentawai souvenirs are sold at a number of souvenir outlets in Tuapejat. To watch a national surfing competition, the tourists who pass through the city of Padang can use boat transport including: KMP ferry Ambu – Ambu which departs from Port Bungus Padang goal Tuapejat with ticket prices Rp.80.000 up to Rp.90.000 / person. Jun - 09 | By: zikri | No comments. 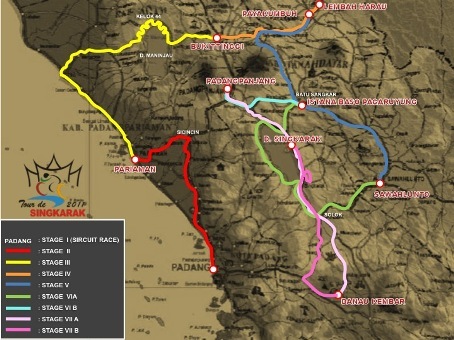 Tour de Singkarak 2011 will be held starting next June. This year’s Tour de Singkarak entering in her third year. This championship has officially become an annual event organizer Union Cycliste Internationale (UCI). 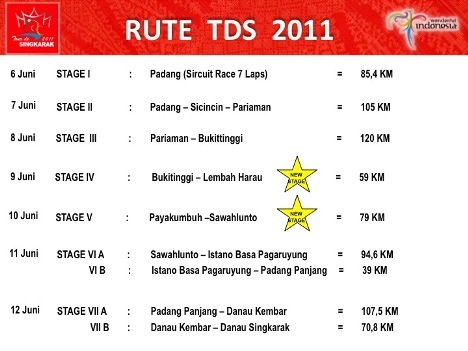 For this year, UCI set a Tour de Singkarak held on 6 to June 12, 2011. The competition was attended by 225 riders from 10 teams in the country and 15 overseas teams and taking seven stages across a variety of natural beauty and culture in 12 districts / cities in West Sumatra with a total distance of 813 kilometers. The number of stage or stages of this year increased compared to the previous year that is six. Last year Tour de Singkarak cover a total distance of 551.7 kilometers. June 12 Stage VII A; Padang Panjang – Batipuah – Lake Singkarak – Alahan Panjang – Twin Lakes.